It looks like there are several people that are going to participate in this CAL that begins on Friday, January 5. I'm really bad about procrastinating, so I thought if we had a thread to share our progress, maybe I'll keep on track. Sounds like a good plan! Maybe this one won't take me 11 months! I bought the yarn pack for this - but decided to make the Summer Harmony pattern. I DO love granny squares! Judy, I took a look at that pattern. It requires sewing pieces together! ACK!!! My feelings exactly! Grannies and other squares are pretty but I hate joining. I knew I wasn’t the only one! Im tempted by this CAL and actually had the yarn pack in my basket, but I can’t justify buying yarn, (even at a good price) when I literally have closets full of yarn, certainly enough to make a few dozen blankets! I know the yarn is soft and pretty. I have a real life friend who is planning to make the blanket. I may may join in, using yarn from my stash, but I’m not sure yet. I have a poor track record when it comes to finishing large projects. Doing it from your own stash is a great idea! I'm color intimidated, so the yarn pack is good for me even though I already have lots of yarn. The grands will have lots of blankets over the years and not many toys because I would rather crochet a whole blanket than all those little pieces that have to be put together for critters and toys. I know - which is why I always weave in the ends as I go. I learned that lesson the hard way! I agree - I have made dolls and things over the years - but they aren't fun. I think it means we're going to have a bitter cold, snowy winter!!!! Our temps in southern Indiana have been in the 10's and lower for about a week, and don't look much better in the forecasts!!! Br-r-r-r-r-r !!!!!! I have several almost finished projects, so I may not get started this weekend. I'd like to get at least one of these out of hte way first. The Woodland CAL is next on my list of things to make. Already have the yarn. Just waiting for the 5th. Yeah, I think the squirrels are saying it's going to be cold for a while! I've got one project I need to work on, but I'm going to try putting some time in on both and see how it goes. 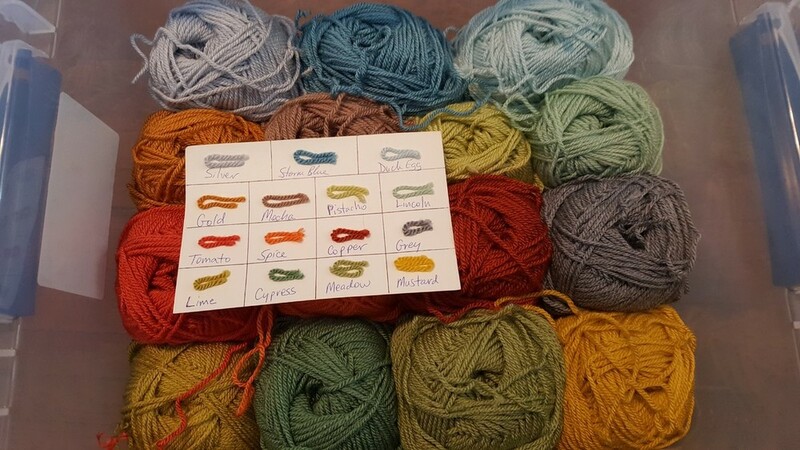 I need to get the yarn out and make a card with a snip of yarn and the color names. That is working well on the moorland blanket, which I also need to work on. I am reduced to expletives this morning. As my mom would have said "well, cat hair!". I got out my woodland yarn and went to look in the basket of the moorland blanket to see what size hook I was using. No hook! I was thinking pink handle. All those hooks are in the hook jar and pink is a size smaller than called for and I really think I went up a size. I guess I'll actually have to do a swatch this time. Rats! The first section is available. My yarn is out, organized, ends ready to pull, and key card made. Hopefully I'll be able to make the gauge swatch this afternoon. Fun! Maybe I can get started this weekend! I had to frog a row and a half last night. I started the fourth color stripe on the wrong end; realized it when I got partway into the flo sc row. It's an easy to remember stitch pattern. The flosc row is a little slow to work. Started the Woodland CAL last night and it's not going well for me. The waves are not lining up on top of each other. I'm not sure what the problem could be. The only issue I've had is making sure I skip a stitch at the beginning and end of the five spaced dc. I missed one a couple of times and had to go back. I finally got back to the cal and am up to the spice row. Debbie, any luck figuring out the problem? Mona, yes, I did figure out the problem. It was the dummy crocheter who wasn't reading the pattern correctly. I was only putting one set of six dc in the top. It called for two sets. DUH ! I have two projects to finish before I start and even though I've been crocheting for over 40 years I still miss things because of reading the pattern too quickly! And also assuming I know where it's going....I feel for you! Glad you've got it going now. I realize she wrote it to match the pattern repeat, but it was a little odd to not combine the two sets of dc. Yes, it would have been much clearer if she had combined the sets. Well, lesson learned. I was able to add quite a few more rows yesterday while doing laundry. I am not making my afghan as wide as the pattern. Mine is about half as wide. So it goes very quickly. And I must say I am loving the color combination.